Early in 1971 a four plane VMCJ-2 Detachment was attached to the Carrier Air Group on the Forestall for a six month cruise replacing a Navy VAZ Detachment. The primary purpose of the deployment was to evaluate the aircraft and its electronic warfare systems and equipment in the Carrier environment. After a short period of time it was obvious that being a substitute for one of the regular CAG units didn't win the Detachment a popularity award. There was some tension on the Flight Deck between our Plane Captains and their counterparts which dissipated after a few weeks when the "regulars" in the CAG realized that the newcomers were professionals who wouldn't be intimidated and who demanded mutual respect. Another obvious example of the initial tension was when the Ship's Captain included me, a Marine Major, on the the list to become qualified in Ship Underway Refueling. After a few nights of duty on the Bridge, I was informed that one of the Navy Officers had pointed out to him that only Naval Officers can command a ship when underway and I was removed from the assignment. It worked out for my benefit because O-4s were required to stand Shore Patrol Duty and the Captain, unhappy that his training schedule was questioned, decided that although I was an O-4, as OIC of the Detachment I was excused from Shore Patrol assignment. Major Fallon, the Detachment's Executive Officers, wasn't so lucky and he was assigned that Duty in one of the choice ports where his spouse was waiting. The Carrier did not have enough space to accommodate all the EA6A unique electronic equipment there fore a repair facility, staffed by Detachment personnel, was set up in Rota Spain. The SOP was to load one of our aircraft with all the electronic boxes needing repair and send them, on the last launch of the night/day to Rota with orders to return for the first aircraft recovery time when the ship returned to sea. During the entire deployment period there was a "black oil" shortage and all ships were directed to spend a significant time in ports or anchorage which provided additional time to repair the equipment before returning it to the ship. 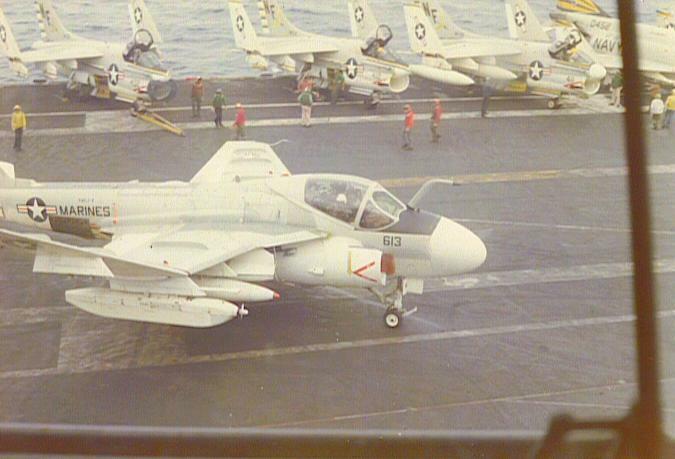 The Detachment's mission of exposing the Carrier and attached ships crews to an active ECM environment provided to be very positive training for all concerned, however there was a problem with training the RIOs of the fighter squadron. When running intercept exercises, although we could still hear the radars in the "sweeping" mode vice a "lock on", the fighter crew would call "fox one" and "fox two" indicating a radar lock-on and subsequent "kill". It was obvious that these so called "kills" were simply indicating visual intercepts. To solve the problem we requested/received permission from the CAG, to run lights-out intercept training at night 1000 ft. above the fighters. That stopped the majority of visual "kills" as the RIOs were forced to use their equipment as designed. Based upon the mission accomplishments of the Detachment, COMNAVAIRLANT directed that the Detachment be cross decked at Rota Spain to the Saratoga and complete a second six month deployment. There were two Carriers assigned to the Mediterranean during the second deployment, the Saratoga and the America, and midway through the period we were directed to provide training to the latter ship. However, before this could be accomplished there was a problem; one of the Saratoga's crew, infatuated with a lady in Athens, sabotaged the ship causing loss of two boilers/engines. The CAGs response was, although we were anchored off Athens, down-load most of the fuel from our aircraft and catapult them to recover on the America. It worked and a short deployment on that ship was enjoyed by all. We returned after only a total of 10 1/2 months, the cruise being cut short, I think, because of the "black oil" problem, was awarded a Unit Citation and more important, given a new overseas-control-date that kept us from being transferred to WestPac for a few more years.